Chasin' Mason: Fivin' on Friday! HAPPY FRIDAY!!! I'm so happy that today is Friday! We have a relatively low key weekend planned and I'm pretty excited about it. After working all weekend last weekend, I'm excited to sleep in (you know, until 7am -- hopefully) and to just run errands and have a play date. But first... a little Five on Friday! 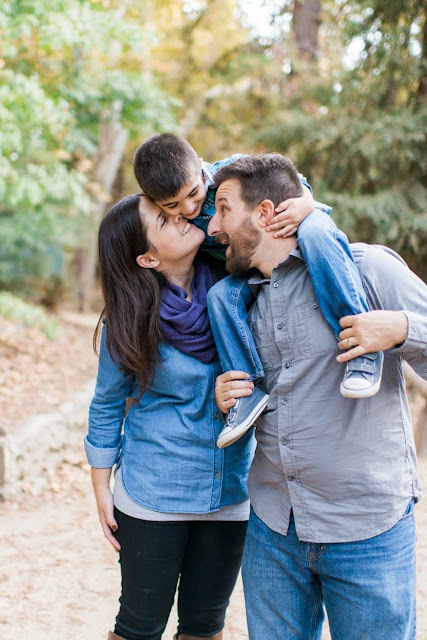 I got a sneak peek from the photographer of our family photos (Erika from Freebird Photography) that we took a couple weeks ago and all I can say is... ALL THE HEART EYES. Seriously, Mason's hand around Seth's head/neck. I die. If the others are even half as good... here's my wallet. Take my money. 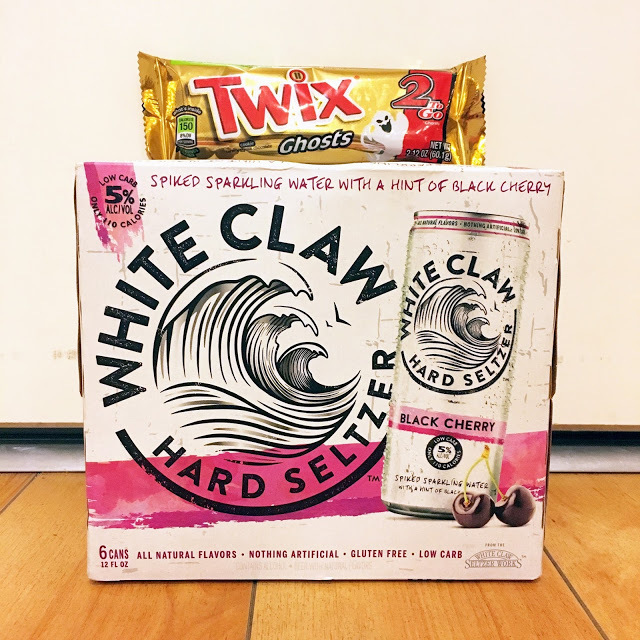 I talked about these White Claw drinks on my $10 at Target post on Monday and said I hadn't tried them yet and a lot of you wanted to know what I thought of them when I did try them. Well, I tried them earlier this week and I like them! They have a different taste than what I'm used to (I mostly drink wine), but I've been really into seltzer water lately and these are a fun, alcoholic take on those with minimal calories. I'm definitely going to be drinking the other 5 in the pack and would love to try more flavors! Earlier this week, it actually felt like Fall. REAL FALL WEATHER. AND it even rained! RAIN. I don't even know when the last time it rained was. Now, don't get me wrong. It was for like a couple hours, and most of it was during the night. 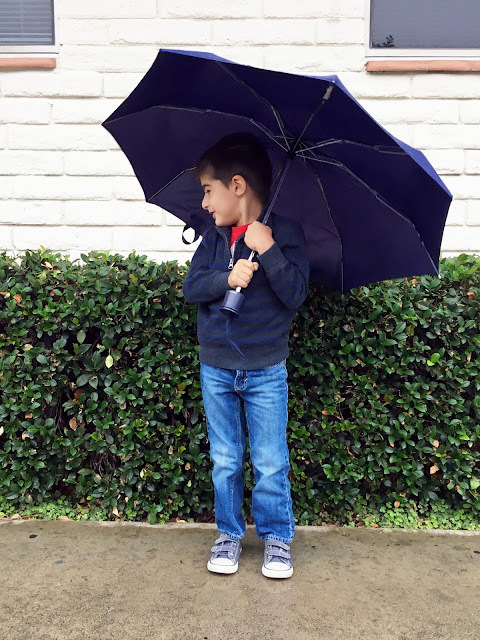 I normally HATE when it rains when I have to go to work/take Mason to school but he was having so much fun playing with the umbrella that it almost makes me wish this would happen more often! 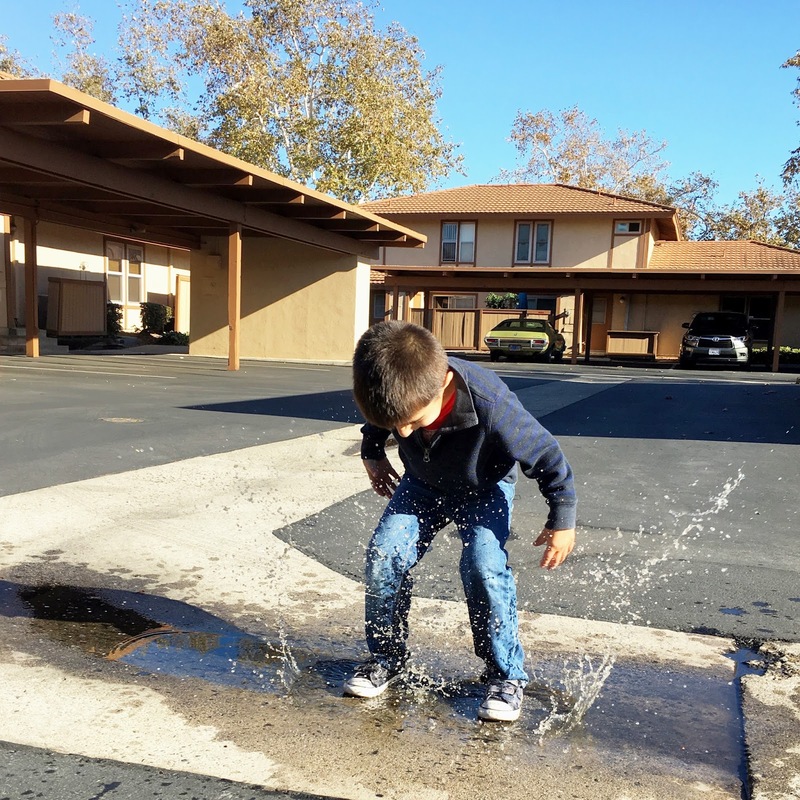 When we got home, there were still some tiny puddles in our parking lot area so I let Mason have at it. I'm always so bummed that it rains in the morning and in the afternoon, when we get home, it's all dry, so I was so stoked when we got home and there was one last puddle! Mason had the best time jumping around for a few minutes. Last week, Seth was gone for a night and I was in charge of making dinner. I should really say making loosely since I'm terrible at cooking and usually opt for take out. Well I "made" dinner by going to Chick-fil-a. 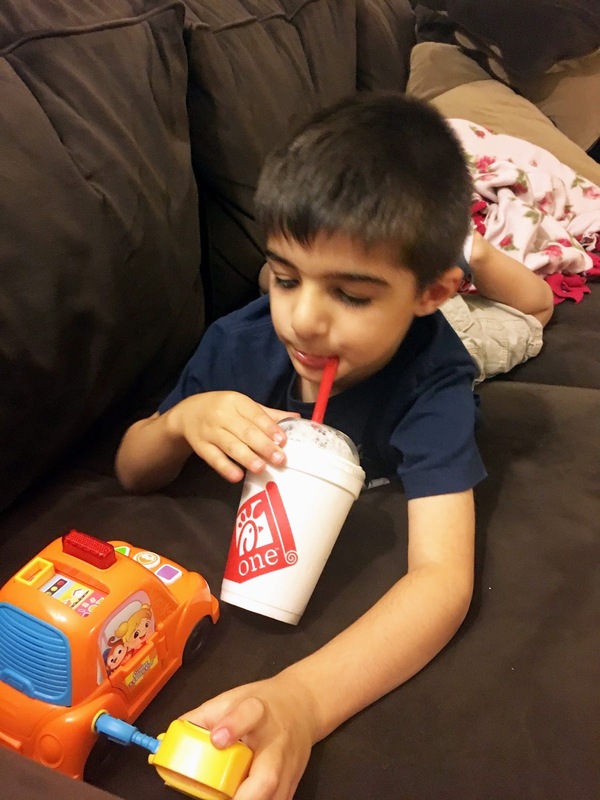 Of course I never say no to Chick-fil-a milkshakes and when Mason said he wanted one too, I knew we had to get one to share. Lucky him and unlucky me but he pretty much stole the whole thing and refused to share (except when I stole it back). He wouldn't even put it down to play with his toys! Premier Glow Light Up Toys. 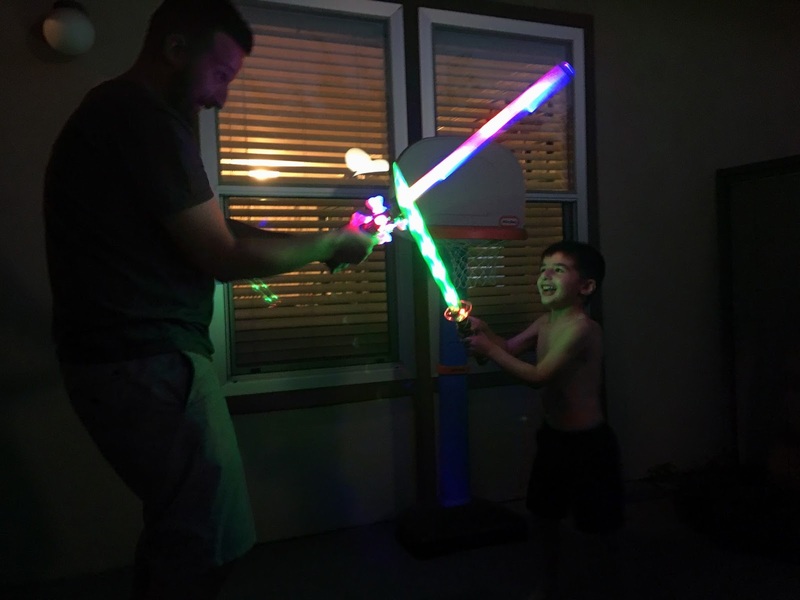 We recently got to try out some glow in the dark toys from Premier Glow. To say Mason loved them would be an understatement. The second I opened the box, he was in there pulling everything out to see what he had gotten. 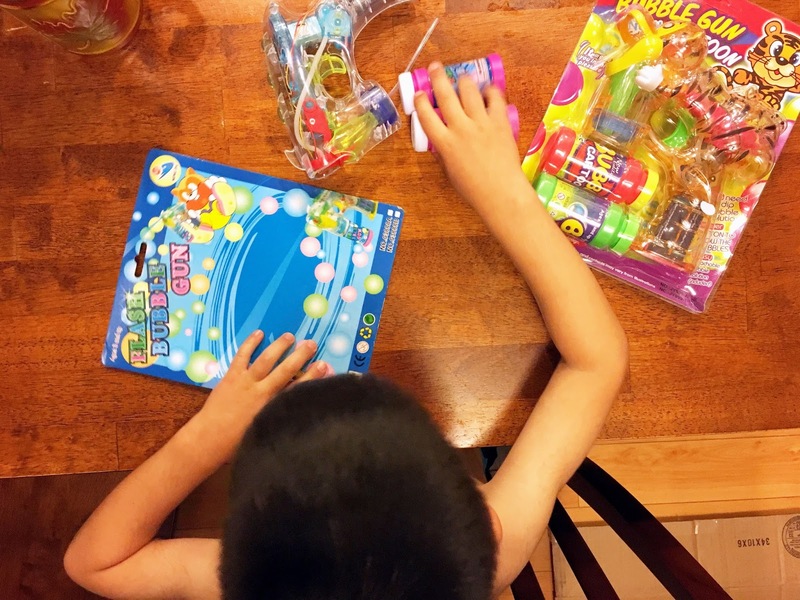 I had originally thought that they were just sending us one bubble gun, but when I opened the box and saw all the goodies they sent us, I was blown away. To say they spoiled us would also be an understatement! Mason immediately went for the bubble gun. He's recently been on a bubble kick so I knew he would be all about it. 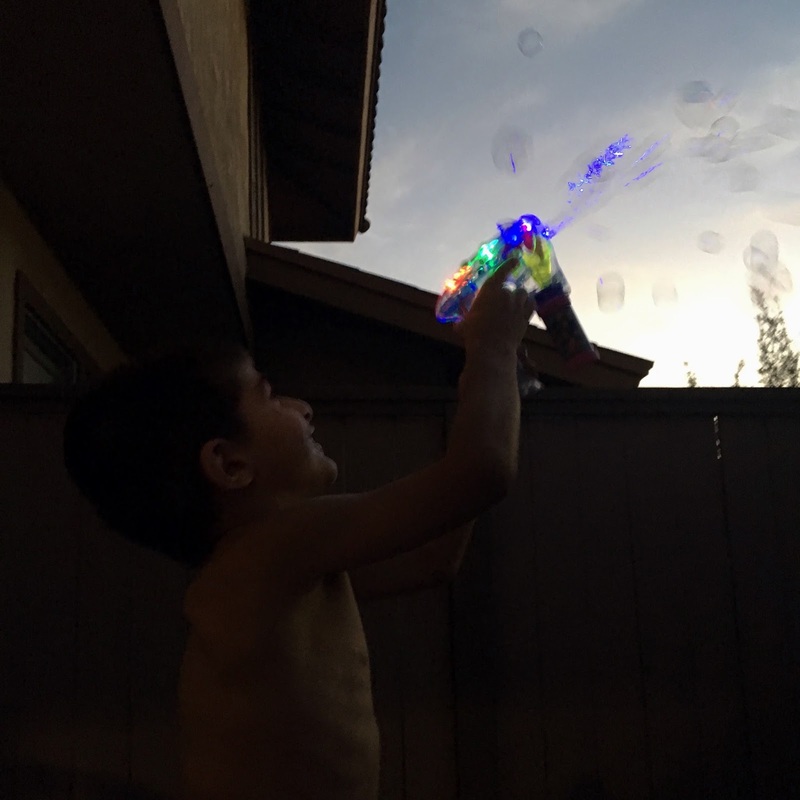 I helped him unwrap the bubble gun and I added the bubbles, and then we were off to go outside to use it. Sorry for the bad quality photos. 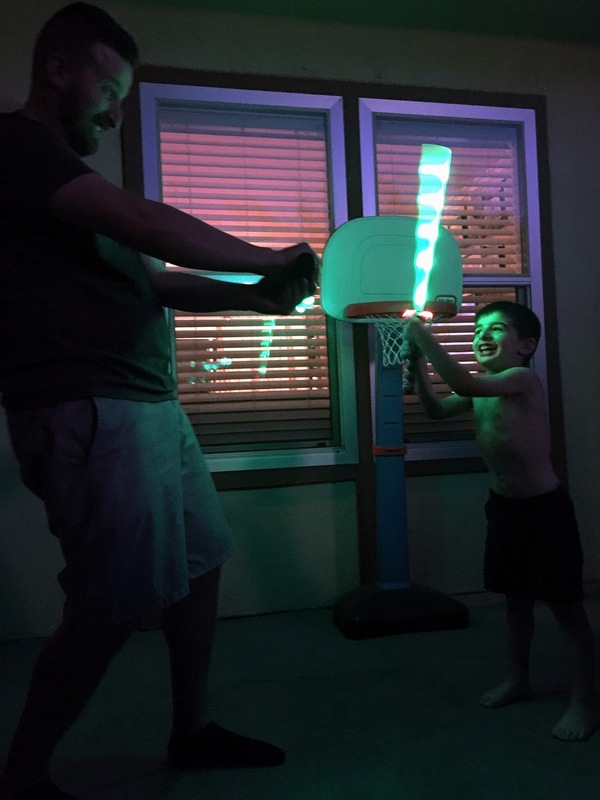 It's terribly hard to photograph the glowing light at night with a kid who moves at lightning speed. But I guess it just goes to show, he was having a great time! Overall, we were extremely grateful to be able to try out all these light up products. I would say that I don't think that they are different or special over similar ones that we've tried before, but looking at the prices online, I would definitely say that you'd get a great deal for the price if you bought some! These are super fun and would make great party favors at a birthday party or would be super fun to use while trick or treating on Halloween! Disclaimer : I received these glow in the dark products free in exchange for my honest review. The opinions stated above are 100% mine and the love for the toys are 100% Mason's. OMG girl. All the heart eyes for your sneak peek. That photo is absolutely everything! I love it so much. Can't wait to see the rest. Cam is obsessed with milkshakes too. Give him a strawberry one and he's a happy boy. Oh I'd be dying over that sneak peek! It's so good and so excited to see them all now!!! And I'm all about the milkshakes too! And Noah's like this too now, hence why I no longer share! I'm a horrible cook too - when Dave travels, I dread having to make dinner! Great glowing products you got there! CFA has fantastic milkshakes. Cookies n cream. Enough said. I LOVE your sneak peek. I can't wait to see more! I just booked our family pictures for the 12th and I am now SO super excited for them! Happy Friday!! I'm in LOVE with your family picture, you've got to share more. Don't disown me, but I've never had a chick-fil-a shake.. Might need to add one to our order next time. Mason's face while playing with the glow in the dark stuff is too cute (I think he likes them)!! Love that picture- so sweet! We were going to try some out for Halloween party favors too - the glow bits. But then the hurricane happened and everything went wonky. I felt the same way about browsing the stuff though...things you could get other places but the prices looked quite good! Can't go wrong with glowy swords. Splashing in the puddles, how much fun! They recently opened a Chick-fil-a near me (well not near, near.... more like a 20-30min drive) I may need to go check it out (I've never been) to see why everyone raves! Oh those glow toys are so fun!!! And your family pic. SOOOOO cute! Happy Weekend! I am dying for a sneak peek of our photos. We just got them done yesterday so I have a while still but dang how I want to see something now! That picture is amazing. Can't even wait to see the rest friend. Those glow toys are super Hope you are having a great weekend! One of the things I was looking forward to about moving to CA was the spiked seltzer. They were no where to be found in MS. I like the ones you posted in lime and the Truly brand in grapefruit pomelo is great. I don't know what a pomelo is, but yum! Your sneak peek is SO, SO good! I'm dying to see the rest! The White Claw drinks are on my list for the next Target run (which will probably be tomorrow). I'm always up to try a new beverage! Let's just throw up all the praise hands for Fall-ish weather! Marcus was SO excited when he and Scott got to ride their bikes in the rain. Marcus thought it was the coolest thing, EVER! WOAH! 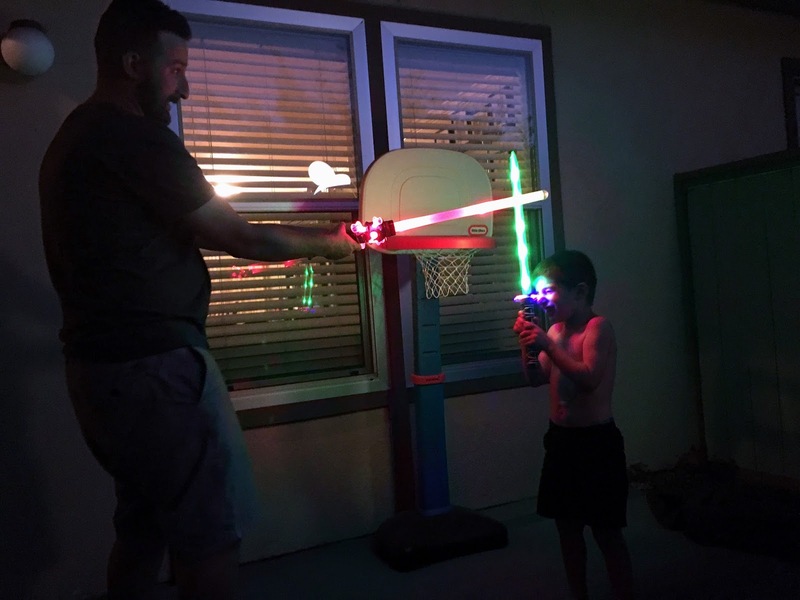 Those light up toys are pretty cool. 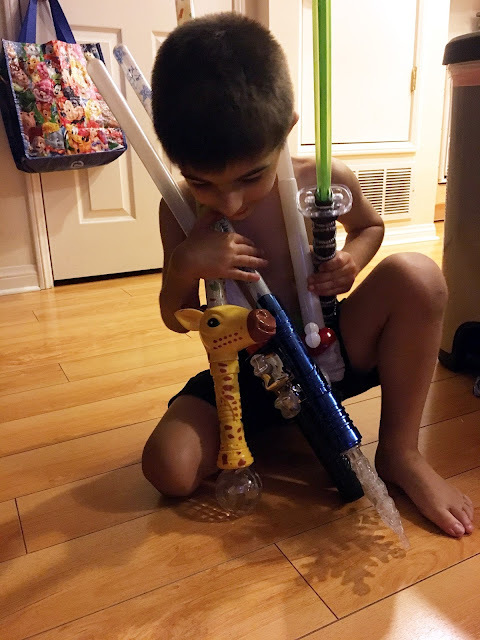 Anything that lights up, blows bubbles, or is a sword is a total win in about any kid's book! I love that first photo! I can't wait to see some of the rest. And yay for actually feeling like Fall! 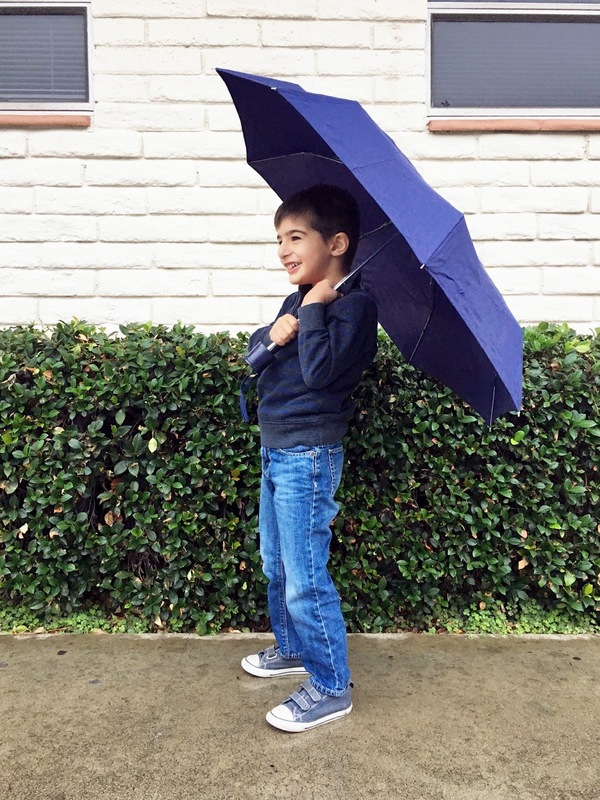 :) The umbrella pics are too cute, and you can't go wrong with anything that glows. So fun! I adore that picture of you three and can’t wait to see more. 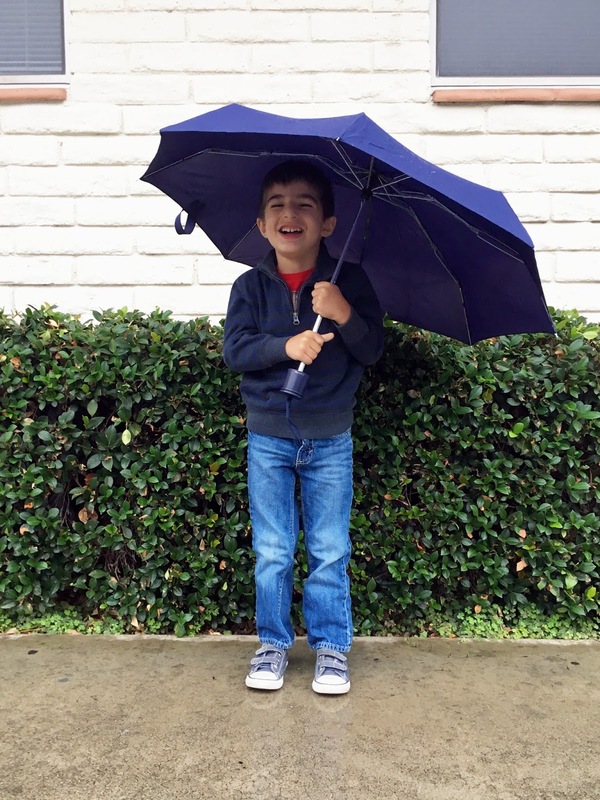 Playing in the rain is so much fun. And Mason looks like he had a blast. The splashing picture is the best. I like the way you ‘make’ dinner. That’s my kind of ‘cooking’! Chick Fil A wins every time. Love the light-up pictures!